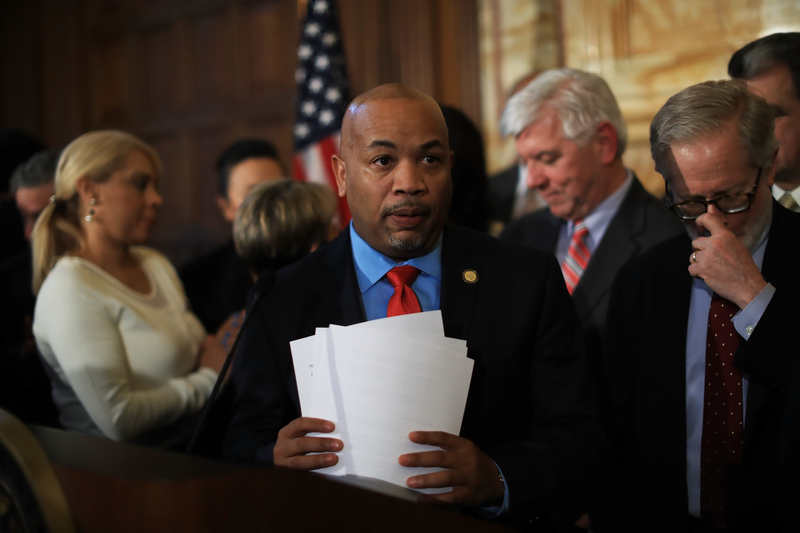 Critics, like the Green Party’s Hawkins, believe Assembly Speaker Carl Heastie, a Cuomo ally, blocked the measures from passage this past session at the governor’s behest – despite the Assembly’s past support. ALBANY – Since the State Legislature ended its session six weeks ago, there have been convictions of four men tied to the Buffalo Billion bid-rigging case, the extortion and bribery guilty verdicts of a former Senate majority leader and the prison sentencing of a former Assembly leader. And it's not just the usual government watchdog groups expressing frustration. “New York State has to get its act together," U.S. District Court Judge Valerie Caproni said last week as she sentenced former Assembly Speaker Sheldon Silver to seven years in prison. "It has to stop." Caproni has spent three months presiding over New York corruption cases, including the Buffalo Billion trial and the trial earlier this year of longtime Cuomo administration insider Joseph Percoco. Now, as Assembly Democrats and Gov. Andrew M. Cuomo are urging the Senate to return to Albany to take up a bill re-authorizing New York City to operate cameras in school zones to catch speeders, there is a call to tackle ethics reform, as well. But that pressure targets Assembly Democrats. They would have to return to Albany for a special session to pass ethics legislation that stalled in its house. Supporters say the legislation is at least a baby-step toward fixing ongoing corruption woes in state government. The two bills that stalled in the 150-member Assembly before its session ended in June are aimed at boosting government transparency and oversight, the measures’ backers say. The Senate passed the two bills and the Assembly – in a non-binding, symbolic move – embraced the same measures when it passed a one-house budget resolution in March. Numerous ideas have been floated – from campaign finance changes to outside income bans on lawmakers – as responses to the run of corruption cases involving state officials over the past 15 or so years. Contracts like the Buffalo Billion deal for the RiverBend solar plant project, the subject of the recent conviction of Buffalo businessman Louis Ciminelli, were not, for instance, subject to pre-approval scrutiny by DiNapoli. The call for the Assembly to return has been echoed the past two days by nearly all gubernatorial candidates: Republican Marc Molinaro, Democratic primary challenger Cynthia Nixon, independent candidate Stephanie Miner and Green Party candidate Howie Hawkins. Libertarian candidate Larry Sharpe said he supports the goals of the two stalled measures, but wants Albany – if it acts – to do so in a reasoned way. "If they rush, they'll make bad laws,'' he said. Cuomo’s office did not respond to email or phone requests for comment. Molinaro on Wednesday said he would support the Legislature returning to Albany if they passed some of the plans he’s already endorsed, including the database of deals and restoration of comptroller oversight of contracts. “The public corruption in this state is beyond ridiculous, and it’s costing taxpayers billions of dollars they don’t have,’’ Molinaro said. Nixon campaign spokeswoman Lauren Hitt said the recent Buffalo Billion convictions and a new federal investigation into a company called Crystal Run Healthcare, a major recipient of state funding and a large Cuomo contributor, highlight the need for the Assembly’s return. “If the governor was serious about fighting corruption, he should have allowed the Legislature to pass those bills during the regular session. The fact that he stopped them from doing so should give all New Yorkers pause,’’ Hitt said. “As the speaker has said, we want to get to a three-way agreement,’’ Heastie spokesman Michael Whyland said Wednesday when asked about a push by some to get the Assembly to return to pass the measures. That means Heastie wants the Assembly, Senate and Cuomo to all agree in advance on legislation. Miner, the former mayor of Syracuse running for governor on the new Serve America Movement ballot line, said the Assembly needs to return quickly to Albany to take up the stalled transparency and oversight measures. “When Judge Caproni says something in New York State has to change, clearly it is stunning to me that the officials in power have not reacted on their own to say that the current status quo is unacceptable and that we are better than this,’’ Miner said. “The pressure is on the Assembly,’’ Miner said. “And their failure to do so should be seen as an indication that they are turning a blind eye to corruption,’’ she added. One of the bill’s Assembly sponsors said action is overdue and noted that he had predicted the public’s appetite for action would increase as the corruption trials unfolded. “Well, the trials have unfolded and the outcomes have not been good. The outcomes underline the importance of accountability and transparency and putting in place mechanisms to deter, discourage and ideally prevent wrongdoing from happening,’’ said Assemblyman Robin Schimminger, a Kenmore Democrat and Assembly sponsor of the database of deals bill. A variety of government watchdog organizations and other groups pressed throughout the past session to get both houses to OK the database of deals and comptroller oversight measures. After the Senate overwhelmingly passed the two bills in May, some of the groups on June 18 took to the steps of a federal courthouse in lower Manhattan – with the first day of the Buffalo Billion corruption trial getting underway inside – to pressure Assembly Democrats to pass the two bills. Two days later, the Assembly ended its 2018 session with the measures bottled up in committees.